There are many benefits to having cameras on a construction site, with nearly no downsides. It seems as if everyone has a security system nowadays, but I think many people would be surprised at how many sites don’t have the extra layer of security. Typically, these are the sites that get stolen from, vandalized, and sometimes face even worse damages. In order to ensure that your site is protected, your best bet is to install security cameras. Having security cameras allow you to check in on your construction site at any time you’d like. Most construction cameras are today are connected to the internet and allow you to view remotely. Sometimes there are delays in construction for various reasons, so you can monitor when employees are working and when they are not. If things aren’t getting done fast enough, you can look into it on the cameras and address the issue without having to jump through hoops to find out what the problem is. 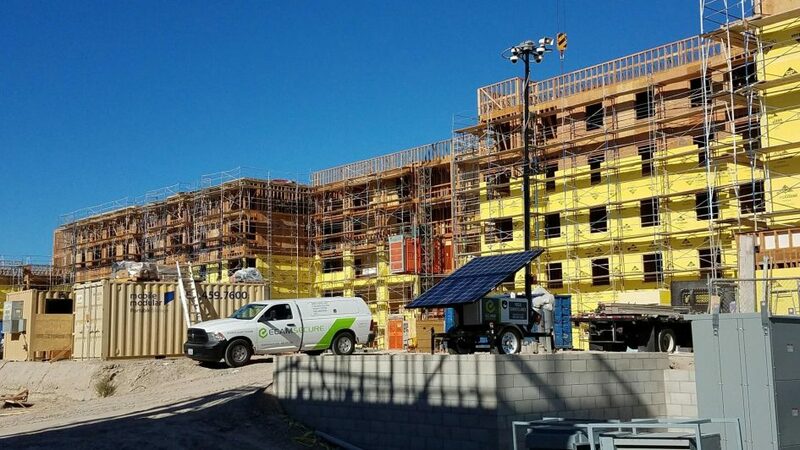 The safety of employees and the security of your jobsite are perhaps the two most important reasons to have cameras installed on your job site. First off, you can check up on the site to make sure that all of the required safety protocols are being followed properly. This will help prevent injury to workers, which is a huge problem on construction sites today. The second part of this is security. Theft on job sites has been growing every year. People know the high value of things like copper piping, steel, and generators. This makes them more inclined to trespass and steal these high-price items. Problems like these will not only slow the progress of your project but will cost you thousands of dollars to replace, not to mention downtime. Having cameras on site deters thieves and trespassers, making it much less likely that they will even attempt to steal from you. Time-lapse is a great feature that some major security companies offer. A time lapse security camera will take photos of the progress on your job site at a set time. Usually, a company that provides construction time lapse will have their own software to access and monitor the cameras. Make sure the time lapse software you decide to use is intuitive and meets all of your needs. Options like calendar view and the ability to overlay images at different stages of your project can be very useful. Most security cameras can be used as time-lapse cameras during the day, and switched to security cameras at night. They will allow you to monitor progress on your job site from a high definition camera, without having to sift through hours of video. It can also provide advertising and other promotional opportunities for your company by creating time lapse movies from groundbreaking to your completed project. You can edit the footage to put on your company’s website in order to show progress on new locations or homes you have built. You can easily adjust these movies to be as long or as short as you’d like, and use them for a multitude of different purposes. Chances are that as someone working for a construction site, you have many people to update on the progress of your project. Cameras are very useful in this sense. Video and time-lapse movies accessed online by project managers and clients during meetings. This will allow them to see the progress for themselves, rather than just hearing descriptions of it or having to travel all the way to the site just to make sure everything is going as planned. Clients will be much more satisfied if they are able to look at the videos for themselves.